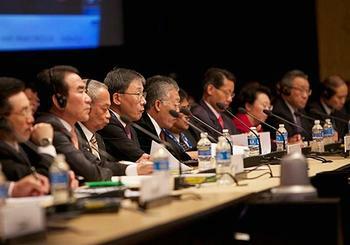 SAN FRANCISCO, California, September 15, 2011 (ENS) – Transportation and energy ministers from 21 economies in the Asia-Pacific region have agreed to make their transportation systems cleaner and more energy-efficient for livable, low-carbon communities. The announcement came during the first-ever joint Transportation and Energy Ministerial Conference held by the Asia-Pacific Economic Cooperation (APEC), the principal economic organization for the region. 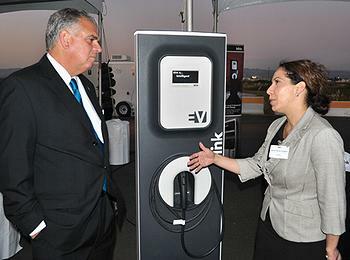 U.S. Transportation Secretary Ray LaHood and U.S. Energy Secretary Steven Chu hosted the San Francisco meeting on Tuesday. It was followed on Wednesday by a transportation ministerial meeting, during which APEC transportation ministers further discussed promoting innovative, environmentally sustainable transportation. “To create jobs and lay the foundation for a prosperous future, we must grow our economies while staying mindful of 21st-century challenges like climate change and energy efficiency,” Secretary LaHood said. “Our roadways, runways, railways, waterways, and transit systems all must move greater numbers of people and products while leaving a smaller environmental footprint,” said LaHood. The transportation sector accounts for two-thirds of U.S. oil use and contributes one-third of U.S. greenhouse gas emissions,” observed LaHood. Recognizing that transportation accounts for a large share of energy use and greenhouse gas emissions, the APEC ministers directed their energy and transportation working groups to study ways to make their transportation systems more energy-efficient. The ministers noted that APEC economies are making good progress toward the goal, adopted by the organization in 2007, of reducing the use of energy in economic activity by at least 25 percent by 2030, and called for greater effort to achieve this goal. They also called for further efforts to phase out subsidies that promote the use of fossil fuels. 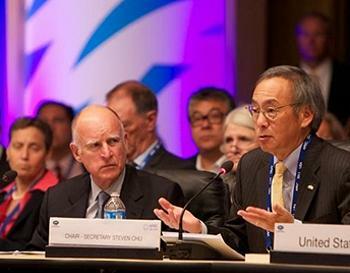 In his welcoming remarks, California Governor Jerry Brown called climate change and mass unemployment “twin challenges” the Pacific Rim economies are facing. “It’s time for a war on unemployment, find the jobs, and do so by investing in the renewable energy, the efficiency technologies, the innovative transportation, the land use policies,” Brown said. The ministers recognized how livable communities contribute to reducing energy use, carbon emissions and travel times. They called for the development of performance measures to evaluate how locating development near transit, expanding rail and bus service, and promoting bicycling and walking contribute to more energy-efficient transportation. The ministers called for the promotion of biofuels, natural gas vehicles and electric vehicles to reduce the use of oil in transportation. They also stressed the need to maintain consumer confidence in electric vehicles by taking precautionary steps to ensure their safety, and called for harmonized approaches to addressing EV safety. Speaking at the meeting, China’s Transport Minister Li Shenglin said his government is making efforts to improve the regulatory framework for the development of green transport, move forward an integrated transport system, and put the development of public transport first. China is working to strengthen the application of science and technology and information technology in the development of green transport, said Li. Because freight transportation accounts for a substantial share of energy use in the APEC region, the ministers said that the working groups would develop strategies and best practices for improving energy efficiency in the movement of freight. They called for measures to encourage shippers to switch from energy-intensive transportation modes, such as trucks, to more efficient rail and maritime transportation. “We also strongly encourage economies to participate in the World Forum for Harmonization of Vehicle Standards of the United Nations Economic Commission for Europe,” the ministers said.